Kabul/Kuala Lumpur/Geneva 28 March 2019 - Ten million people in Afghanistan – more than a quarter of its population – face severe acute food insecurity and need urgent help after floods and drought, say the Afghan Red Crescent Society and the International Federation of Red Cross and Red Crescent Societies (IFRC). She added that one of ARCS’ leadership members will monitor the relief items distribution procedure from now on. On 5th March, 2018, Afghan Red Crescent Society’s (ARCS) Secretary General, Dr. Nilab Mobarez; ARCS Disaster Management Department Head, Mr. Abdul Rahman Kalantari; ARCS’s West Regional Office Head, ARCS Herat Provincial Branch Head, and Italy Project Representatives were observing the optimal distribution of relief items to 300 families who have repatriated from Iran and Pakistan countries to Herat province. On 17th February, 2018, ARCS provincial branch in Kapisa province with the International Committee of the Red Cross (ICRC) cooperation provided relief items to 305 families that are displace from Takab district due to armed conflicts. The relief items include 75 kg rice, 25 kg bean, 15 liters cooking oil, 5 kg sugar, 2 kg green tea, 2 kg salt, 7 blankets, 1 tarpaulin, one set of cooking dishes, one water can, 4 male scarf, 3 female scarf, 3 cloth washing soap, 7 bath soap, 2 towers, one solar charge torch, one drawing note book, one box of pencil and one platter. Devastating floods in many villages of Serobi district have killed 11 and wounded 7 individuals in addition to destruction of 56 houses. ARCS has immediately reached the areas and run a precise survey. Subsequently, head of ARCS Kabul branch optimally distributed relief items among the 56 affected families while elders and local council members were observing the process. The distributed relief items included a bag of flour, 5 liter cooking oil, one tent, one cooking set, one tarpaulin, 7 blankets and one water can. Afghan Red Crescent Society (ARCS) provides relief items to affected population in line with seven fundamental principles. In addition to ARCS’s previous assistances, ARCS has provided relief items to 500 disables, destitute and internally displaced families who have affected due to armed conflicts in Baghlan province. ARCS’s authorities have optimally distributed relief items while Baghlan province sub-governor, head of provincial council, Baghlan province parliamentarians and ARCS north-eastern regional zone office head were observing the distribution process. Recent heavy snowing have caused avalanches in various mountainous areas of Afghanistan that have caused casualties and destroyed financial resources. ARCS’s staff and volunteers, as always, have reached the affected population and optimally distributed relief items to 1078 families. The beneficiaries have considered ARCS’s humanitarian aids vitally important and the lack of these items and services could highly jeopardize their lives. Consequently, they have appreciated the staff and volunteers commitment in rendering health first aid services and providing relief. Assisting man-made and natural disasters-affected population and destitute families is ARCS priority in line with the Movement’s fundamental principles. ARCS had run a survey and recognized 600 destitute families in Logar and another 600 in MaidanWardak provinces. Accordingly, ARCS had optimally distributed the relief items that were donated by United Arab Emirate. The donated relief items included 10 KG flour, 5 KG rice, 3 Liter oil, 3 KG bean and sugar. Afghan Red Crescent Society (ARCS), in line with the Movement’s fundamental principles that guides humanitarian affairs to alleviate human suffering from man-made and natural disasters, provide relief items in accordance with the affected populations’ emergency requirements. ARCS Nangarhar branch has provided relief items to 1847 affected families in 2015, and the branch has provided relief items to 2020 affected families in 2016. Emergency Operation Center (EOC) of ARCS Disaster Management Department reported that recent armed conflicts in Kondoz, Hilmand and many other provinces of Afghanistan had taken many civilians’ lives and financially damaged many resources of incomes, so many people are internally displaced to Kabul, Balkh, Takhar, Badakhshan and Kandahar provinces. 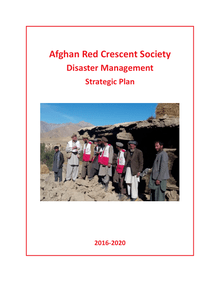 Emergency Operation Center (EOC) of Afghan Red Crescent Society’s (ARCS) Disaster Management Department reported that armed conflicts in Chaparhar district had displaced 900 families to Pachir Agam, Behsood districts and Jala Abad city. Accordingly, on 20th October 2016, Nangarhar Provincial Disaster Response directorate ran a meeting; thus, ARCS Nangarhar Provincial Branch was assigned to run a survey on displaced families. Consequently, after running the survey, ARCS has provided 10 different of relief items to 171 affected families. Afghan Red Crescent Society’s Herat province branch is providing relief items and rendering services in line with the Movement’s seven fundamental principles to alleviate human suffering. Qari Mir Gullab, Herat branch head, reported that the branch had provided relief items to 23 families who were affected by devastating floods according the ARCS norms. He added that five work-for-food projects were running in Kashk Robad Sangi district which three of them have been accomplished. The relief items were partially donated by UAE Red Crescent and the International Committee of the Red Cross. ARCS Disaster Management Department has submitted its survey teams’ reports to ARCS authorities; subsequently, the Emergency Operation Center was tasked to supply them accordingly. Monsoon rains have caused floods in Takhar, Badakhshan and Bameyan provinces where many families have been affected. ARCS Emergency Operation Center has reported floods that have affected 32 families in Bolak, Houze and Fochi village in Takhar province, Shahr-e-Bozorg of Badakhshan province and Yakawlang distrct of Bameyan province. Subsequently, ARCS has provided relief items to 217 affected families based on EOC survey team reports in Sholgara district of Balkh province, central district of Takhar province and Share Bozorg district of Badakhshan province. Recent heavy rains causes floods in number of provinces that results casualties and devastation of properties. On 17 April 2016, ARCS Emergency Operation Center (EOC) has sent its survey teams to prepare a concise report regarding flood destructions and affected population’s emergency needs. Flood has caused the death of two individuals in Karkh and Pashton Zarghon districts. Afghan Red Crescent Society (ARCS), in line with the Movement’s fundamental principle, provides relief items and renders services to affected population from natural and man-made tragedies for preventing or alleviating their suffering. ARCS branch in Balkh province has provided relief items to 30 destitute families in Amani and Eshani projects of NahreShahi district. Accordingly, ARCS has provided relief items to 745 internally displaced families of Kondoz province. In addition, 600 families have been transported back to Kondoz province as well. ARCS has optimally distributed food items and provided aids to affected population from recent floods in Sholgaraand Charbolak district of Balkh province. Dr. Ehsanullah Oughlee, Regional Zone Office Director, said that ARCS branch had supplied aids to 99 and 336 affected families in Sholgara and Charbolak districts which includes rice, oil, tea, bean, water can, tent, cooking set, tarpaulin and blankets. Dr. Oughlee added that ARCS had temporary provided shelters to those families that floods had destroyed their houses.